" + "" + options.cwmoreinfo + "" + "" + options.cwagree + "" + "
" + options.cwbubbletitle + "
Wish you could experience all the fun of a casino without the financial risk? Do you want to provide your guests with a more unique form of entertainment? Or would you like to mark your event with a lively (but friendly!) competition? 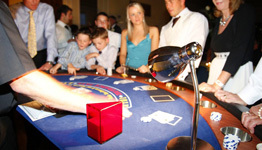 Fun casinos are a novel, interesting and fun way of providing entertainment for your guests, without your guests parting with any money. 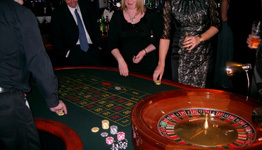 All Occasions Casino is a family run business, which can provide all of this and more! We can prepare a tailor made package to suit your own special occasion. Each fun casino game provided has casino standard equipment and a professional croupier in order to facilitate your guests maximum enjoyment and gaming, and who will be committed to providing a top quality service. 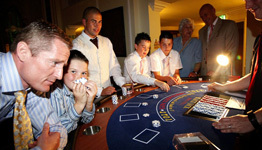 All Occasions Casino operates a family friendly policy and does not impose an age limit on any of the tables, though some casino games are clearly more complicated than others and so we would recommend parental supervision for small children. We appreciate that each event is an individual and personal occasion and we aim to cater to all special requests. You may have some specific requests for your special day; please see the services page and if what you require is not featured then please do not hesitate to contact a member of the team who will make every effort to meet your requirements. © Copyright 2019 All Occasions Casino. All rights reserved.